That is why Hevik, aligning itself with the new European regulations, has invested and obtained the CE Certifications of its products, in order to guide consumers on a product that performs the tasks for which it has been designed. When selecting a jacket or a pair of trousers to be worn when riding a motorcycle, it is essential to read the label first as the materials used and the safety certifications of the product are specified on the labels. As far as certification legislation is concerned, the new European PPE regulation (PR EN 17092), i.e. relating to personal protective equipment, came into force on 21st April 2018. In particular, the new regulation introduces the concept according to which, in order to obtain certification, the clothing item must provide protection against the risks for which it was designed. In the case of motorcycle clothing, there are two risks: impact and abrasion, which are the parameters on which certification is based. Thus, class C garments are certified to protect against abrasion, those of class B protect against impact, while those of class A, AA and AAA, protect against impact and abrasion, according to different methods specified by the intended use. Finally, it must be specified that the individual devices used to provide elbow, knee, back and shoulder protection must, in any case, be certified so as to provide a guarantee in respect of the protection afforded by such devices. 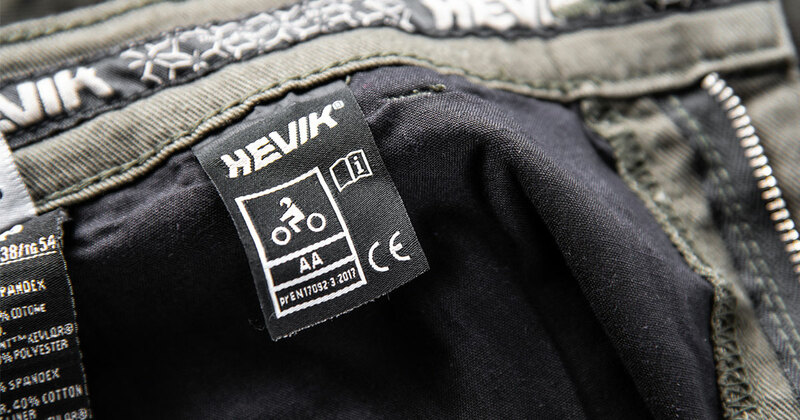 Having clothing that really protects the rider against impact and abrasion is essential for every motorcyclist, because traveling by motorcycle is as beautiful as it is unpredictable and safety is a guarantee that Hevik wants to be sure to provide to all its customers!